Never overwhelming anyone with its geographical size, Rhode Island has always managed to find a niche in the broadcasting industry. From the birth of radio through the start of the department store "wars" in the 1920s, Rhode Island radio became a national trendsetter. The Shepard brothers created the Yankee Network, which launched the concept of sharing programming with affiliated stations. Several formats became standard-bearers for listening concepts throughout the country, from the Top 40 format of the 1950s and 1960s to present-day adult contemporary and sports talk radio. Rhode Island personalities and stations have played a large part in overall industry concepts and growth. Salty Brine, Sherm Strickhouser, Jack Comley, Ed Pearson, Ernie Anderson, and Don Pardo are all names and voices familiar to audiences in the Ocean State and beyond. A broadcast veteran of 33 years, John Rooke has spent more than two-thirds of his career living and working in Rhode Island television and radio. Since he listened to his grandfather's World War II–era civil defense radio and picked up signals from all over the country, the “voices in the box” have motivated Rooke to be clear and concise with his own narratives. 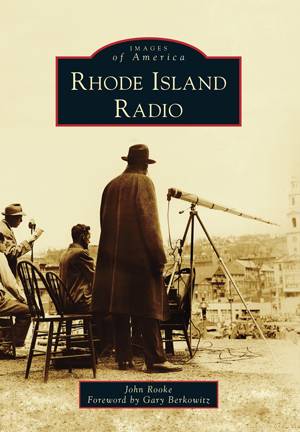 In Rhode Island Radio, he shares the humble beginnings of the powerful and influential industry of radio that Rhode Island helped shape.